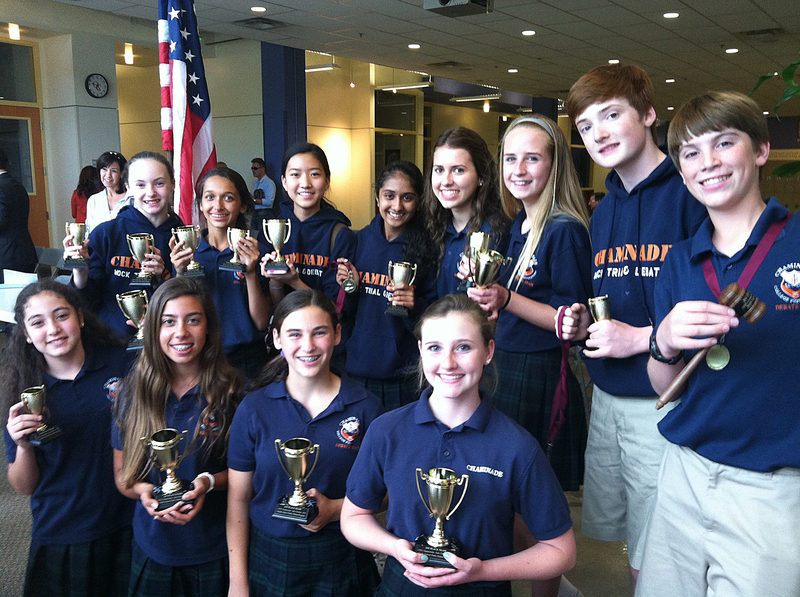 On Saturday, May 3, Chaminade’s middle school debate team won the Golden State Debate League Championship. Out of nearly 40 teams that competed, all five of Chaminade’s teams placed in the Top 10. The team of Lara Mikhail ’18, Jordan Cheney ’18, and Hannah Sellfors ’18 went undefeated and qualified for the final public debate on the topic “The U.S. should pardon Edward Snowden.” In front of more than 100 spectators, Chaminade won the decision against rival Oakwood School and took first place overall. Chaminade also had 11 Top Speaker awards including Michael Keating ’18, Lara Mikhail ’18, Jordan Cheney ’18, Maya Desai ’18, Oceania Eshraghi ’18, Rebecca Steinberg ’18, Kojo Boakye-Nimako ’18, Jackie Mulcahy ’18, Samantha Bader ’18, Claire Rider ’18 who took second, and Louis Gerny ’18 who won the coveted gavel and was named Top Speaker for the championship. This is the fourth time that Chaminade has won the League Championship in the past six years. The team is coached by Mrs. Jennifer Bader and Mr. Bert Bader. This entry was posted in Academics, Debate, Middle School by Chaminade News. Bookmark the permalink.